Thistles are one of life’s prickly jokes. They thrive almost everywhere and carry a nasty sting when they contact skin. However, they have an exciting shape and come in deep purple and blue hues that are irresistible additions to the perennial garden. Learn how to grow globe thistle perennials for season after season of appeal. Globe thistle (Echinops ritro) is in the Aster family. The large spiky flowers appear in early summer and last up to 8 weeks. 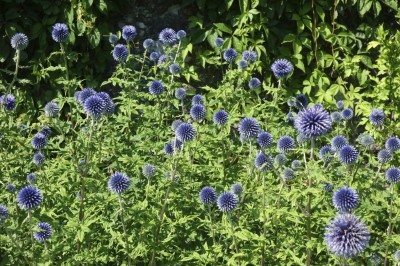 They are perennials, so the plants will make long lasting garden companions with hardy habits and minimal globe thistle care. Globe thistle flowers are particular stand outs with blooms up to 2 inches across on 3 to 4 foot stems. Echinops is the botanical name for globe thistle. They are stunning flowers with deep dark blue petals set in a spiky frame. The leaves are deeply notched, dark green on top and slightly silver underneath and slightly hairy. The plants are native to Asia and Europe and the name means hedgehog in Greek, which is appropriately referencing the prickly blooms. Glove thistle flowers make excellent dried displays and last for years as part of an everlasting flower display. Globe thistle echinops encompass over 120 species, only a few of which are in cultivation. Some common forms are bannaticus; the super spiny exaltatus; ritro, with its white foliage undersides; and sphaerocephalus, which has white to gray flowers. The plants are hardy to United States Department of Agriculture zones 3 to 8. Growing globe thistle from collected seeds is imprecise, but purchased cultivated seed has a better seedling rate. The plants also often self-seed. Growing globe thistle from clump division is the fastest way to get flowers. Divide the basal growth away in spring from plants that are at least 3 years old. You may also take 2- to 3-inch root cuttings in spring to start new plants. Plant basal or root cuttings in loosened soil that is moderately acidic for best results. Water the young plants twice per week for a month and then gradually reduce supplemental watering as they establish. Choose a well-drained site in full sun for the best growth, although they will tolerate partial shade. These perennials are one of the easiest plants to maintain. 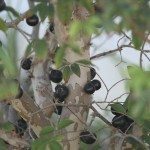 They tolerate drought conditions once established and have few pest or disease problems. Occasionally the heads will be too heavy and require staking. You can cut back the basal foliage to encourage re-bloom. If you do not want any reseeding problems, take off the flower heads after the color fades. Globe thistle care is minimal and you will enjoy watching the bees sample the flower’s nectar. Read more articles about Globe Thistle.